The Vanee Chili without Beans Kit is a unique item that uses an operator’s existing proteins to make a signature chili. It is comprised of two parts: a can of veggies, featuring tomatoes, onions, and green peppers; and a can of chili spices. Combine each of these cans with a can of water and two pounds of cooked ground beef, or chicken, turkey, pork, or sausage. 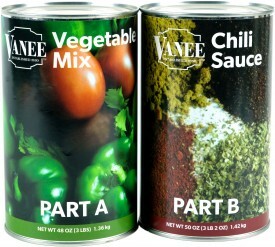 The Vanee Chili Kit is a great way to reduce waste by utilizing leftover proteins. Each two-can kit makes 15 half-cup servings, for a total of 90 servings per case. Combine with beef, pork, chicken, turkey, or sausage to make a signature chili. Mix can contents with 2 lbs of cooked meat and 1 can of water. Convection: Place covered prepared product into 300°F oven for 30–40 minutes until center reaches 165°F. Conventional: Place covered prepared product into 350°F oven for 60 minutes until center reaches 165°F. Microwave: Place prepared product into microwave safe covered container. Heat on high approximately 2–3 minutes per portion or until center reaches 165°F. Stove Top: Place uncovered prepared product over medium heat for 10–15 minutes or until center reaches 165°F, stirring occasionally to prevent scorching. Water, Tomatoes (Contains Tomato Juice, Calcium Chloride, Citric Acid), Onions, Green Peppers, Tomato Paste, Food Starch-Modified, Spices, Salt, Sugar, Soybean Oil, Onion Powder, Garlic Powder, Dehydrated Green Pepper, Citric Acid, Oleoresin Paprika, Yeast Extract.